Coconut Yoghurt is something that will change your life forever, I think I have jumped on the cocnut yoghurt bandwagon a little late but better late than never right? I mean considering that coconut oil used for cooking and as a moisturizer and of course hair oil – I have done it all thanks to having lived in Mumbai. The most amazing taste of coconut oil in food I have eaten has got to be the banana chips sold at small tiny shops mostly to be found outside railway stations where raw banana slices are deep fried in a massive wok gingerly balanced on gas stove. It is a miracle how though these street food stall owners manage to function in tiny spaces in the busy bustling lanes adjoining stations – it is just something I shall never be able to figure out! Ok back to coconut yoghurt – I wanted to use them in pancakes and also use a mix of flours to come up with a pancake that is not just fluffy but a bit crunchy too – a fusion of the dosa with the pancake really. This time I left out the Natvia sugar and upped the berries and let the natural fruit sugars do their magic. Co Yo is a very creamy and delicious yoghurt made with coconut milk – it is 100% dairy free , 100% gluten free – and true to their tag line it really does taste like – heaven in a mouthful! An offshoot of Planet Organic these are now manufactured in Kent by Bethany and her husband Paul, read all about it here. The use of amaranth which is GF and a great source of protine. It contains lysine which most grains lack. Amaranth is a gluten–free food and a source of complete protein—it contains all the essential amino acids, including lysine, which is lacking in most grains. High in fiber and a good source of magnesium and iron,Amaranth is a spectacular addition to your diet. In a large bowl add the oats, amaranth flour, semolina. 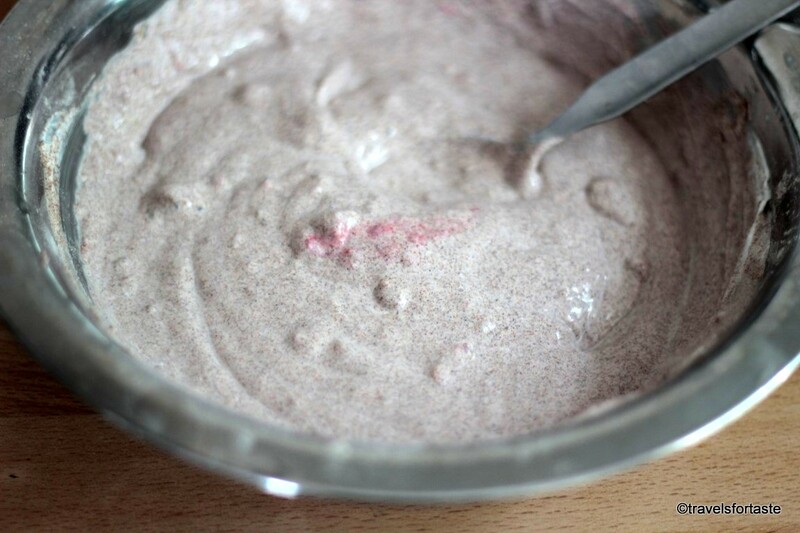 Then add both the pots of yoghurt and mix well. To make your pancakes GF omit the semolina. Then chop the foods roughly and add into the mixture. Dilute the mixture with water until you get a consistency good enough to pour into the pan and make a pancake. Heat a pan on a medium flame and add 1 tsp of olive oil then spoon the mixture and flip when the pancake starts to seperate from the side using a wooden spatula. 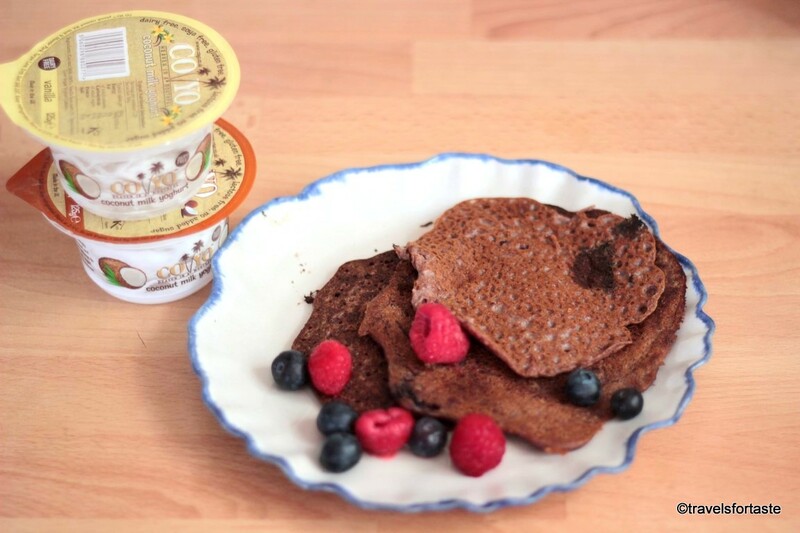 For maximum effect stack the pancakes on a fancy plate, serve with a large dollop of CoYo and a handful of mixed berries. *With thanks to CoYo for sending over the samples. No monetary compensation was offered for a positive review. All opinions expressed here are entirely my own.Kindly do not re-produce any images without my prior permission. Please consult your doctor of you have been diagnosed as a Diabetic before making any drastic changes to your diet. None of the information in this post is to be used for self diagnostic and / or medical purposes. Please consult your doctor and / or a trained dietitian for any existing health conditions. 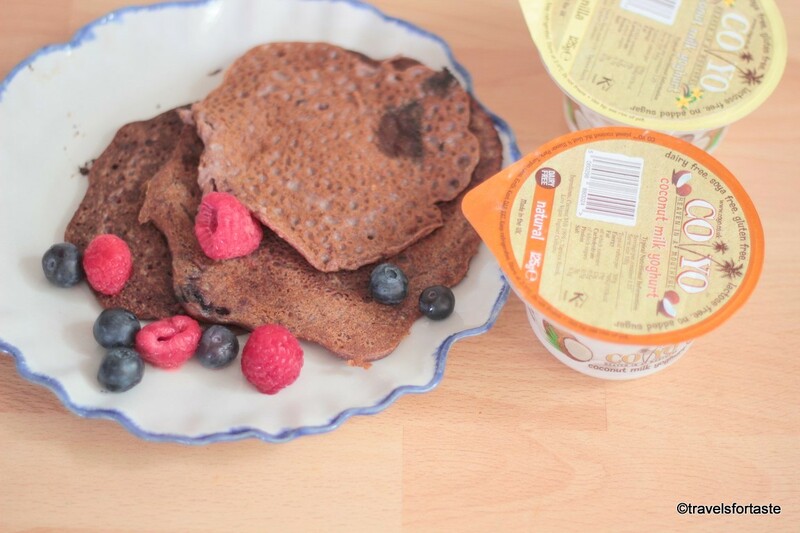 I’ve not tried coconut yoghurt yet, it sounds scrumptious as do these pancakes. Enjoyed reading about the street sellers in Mumbai and I now have images in my head of precariously balanced vats of boiling oil!!! Choclette I have been looking at my India photographs for an apt photograph and will surely tag you if I uplaod one into the post! It is a sight to watch them conduct business in narrow streets amongst what now seems to me as controlled chaos!! I am desperate to try some coconut yoghurt. I can just image how it makes these pancakes taste. I assure you Bintu they taste heavenly! Never to late to jump on the coconut yogurt bandwagon! I did 4 years ago and haven’t looked back. 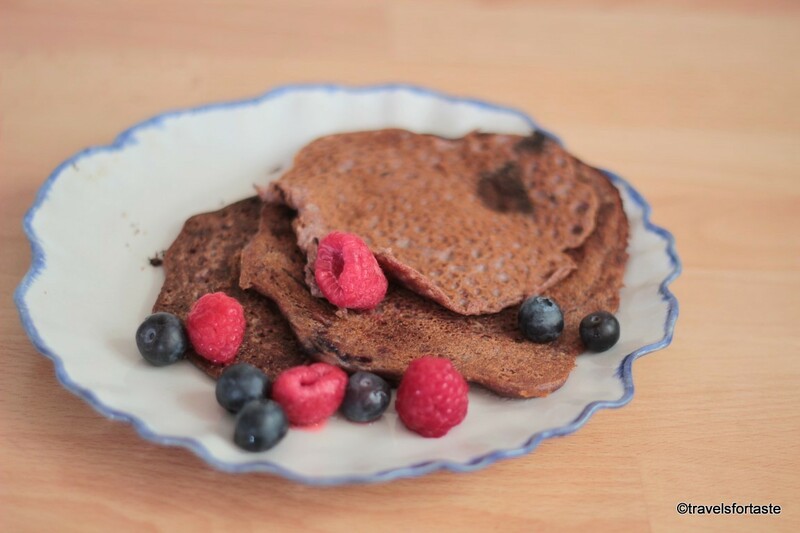 Seriously though these pancakes look ace and I am always looking for different ways to make luscious pancakes! Saved! Thanks Ceri hope you do try the recipe soon, let me know if you. Oh yes am hooked to CoYo and am sure there is no looking back for me either. awww am sure it is Sylv and hope Y feels better soon! weekend is coming so its a great way to try this healthy breakfast option! It is always time to have pancakes. The Co Yo is so creamy and yummy! Yes anytime is Pancake time! I am now in love with CoYo!